For seven decades Katharine Hepburn played a leading role in the popular culture of the twentieth century - reigning as an admired actress, a beloved movie star, and a treasured icon of the modern American woman. She also remained one of the most private of all the public figures of her time. In 1983 - at the age of seventy-five, her career cresting - the four-time Academy Award winner opened the door to biographer A. Scott Berg - then thirty-three - and began a special friendship, one that endured to the end of her illustrious life. From the start, Scott Berg felt that Katharine Hepburn intended his role to be not just that of a friend but also of a chronicler, a confidant who might record for posterity her thoughts and feelings. Over the next twenty years, Kate used their many hours together to reveal all that came to mind, often reflecting on the people and episodes of her past, occasionally on the meaning of life. Here are the stories from those countless intimate conversations, and much more. 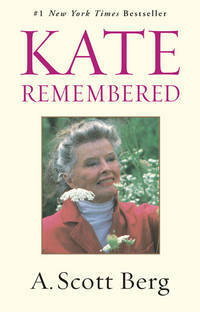 In addition to recording heretofore untold biographical details of her entire phenomenal career and her famous relationships with such men as Spencer Tracy and Howard Hughes, Kate Remembered also tells the amusing, often emotional story of one of the most touching friendships in her final years. Scott Berg provides his own memories of Katharine Hepburn offstage - quiet dinners in her town house in New York City, winter swims (she swam, he watched) in the Long Island Sound at Fenwick, her home in Connecticut, weekend visits with family members and dear friends...even some unusual appearances by the likes of Michael Jackson and Warren Beatty. Finally, Kate Remembered discusses the legendary actress's moving farewell, during which her mighty personality surrendered at last to her failing body - all the while remaining true to her courageous character. Kate Remembered is a book about love and friendship, family and career, Hollywood and Broadway - all punctuated by unforgettable lessons from an extraordinary life. Berkley. PAPERBACK. 0425199096 Item in good condition. Textbooks may not include supplemental items i.e. CDs, access codes etc... . Good. Berkley, 2004. Paperback. As New. Disclaimer:An apparently unread copy in perfect condition. Dust cover is intact; pages are clean and are not marred by notes or folds of any kind. At ThriftBooks, our motto is: Read More, Spend Less.Dust jacket quality is not guaranteed. Berkley. PAPERBACK. 0425199096 Ships from Tennessee, usually the same or next day. . Fine. 2004. Berkley, 2004. Paperback. Very Good. Disclaimer:A copy that has been read, but remains in excellent condition. Pages are intact and are not marred by notes or highlighting, but may contain a neat previous owner name. The spine remains undamaged. At ThriftBooks, our motto is: Read More, Spend Less.Dust jacket quality is not guaranteed. Berkley. PAPERBACK. 0425199096 May have light shelf wear.|1.04 . Very Good. Berkley. PAPERBACK. 0425199096 Ships promptly from Texas. . New. 2004. Berkley. PAPERBACK. 0425199096 Very Good Condition. Tight and Neat. Five star seller - Buy with confidence! . Very Good. Berkley. PAPERBACK. 0425199096 Remainder mark . Fine. Berkley. Paperback. 0425199096 Unused Like New . Fine. 2002-08-06. Reprint. New York: Berkley Books, 2003. First Paperback. Trade Paperback. Fine/No Jacket. 8vo - over 7¾" - 9¾" tall. xii, 370 pp. First printing thus. Berkley. PAPERBACK. 0425199096 Crisp pages and tight binding. Appears unread. Slight shelf wear on cover. . Fine. Berkley. PAPERBACK. 0425199096 Crisp pages and tight binding. Appears unread. Light shelf wear on cover. . Fine. Berkley. PAPERBACK. 0425199096 . . New. 2004. Berkley Pub Group, 2004. First Thus. Trade Paperback. Very Good-. A few pages have a little bit of highlighting, Some writing on title page, otherwise in in very goood condition. 370 pages. New York: Berkley Books, 2003. Name of former owner whited out by top edge of insdie front cove, crease line down spine. 370 pages.. 1st Printing Thus. Soft Cover With French Flaps. Very Good+. 8vo - over 7¾" - 9¾" tall.